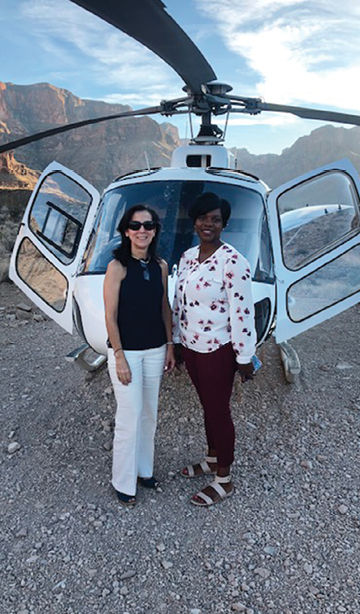 As the spectacular tan and orange landscape, the clear blue water and the architectural magnificence of the Hoover Dam sprawled below her, Maria Icaza reflected on the relationships, connections, and commitment to hard work that brought her and her general manager Kaiesha Carter on a helicopter ride and, later that day, to a champagne dinner in the Grand Canyon. Icaza, who is 54 and operates a network of Dunkin’ shops in southern Maryland, bestowed the experience on Carter recently when the pair attended the Dunkin’ convention in Las Vegas, as a way to honor Carter’s excellent work over the past eight years. “She started as a crew manager, then shift leader, then moved up to managing her own store, and became a general manager,” Icaza says about Carter. “I like people knowing that you can grow from within in a network like mine, and you don’t necessarily have to go college,” Icaza says. 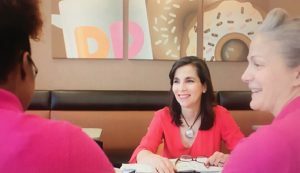 Training the right people and watching them grow as they support the business has been a cornerstone for Icaza as she has established as she has established herself in the Dunkin’ system. Icaza currently owns three Dunkin’ shops in St. Mary’s County and is building a fourth from the ground up in Prince Edward County, which she expects to open in late 2018 or early 2019. Her first store, located in California, Maryland, opened in 2007, and the second launched in Charlotte Hall, in 2011. The third opened in Leonardtown in 2016. A fifth store, in Prince Frederick in Calvert County, is expected to open in 2019-2020. 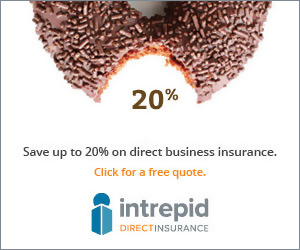 Selling donuts and coffee is a change from Icaza’s original career path. Icaza attended New England School of Law in Boston, where she earned her law degree and met her future husband, Glenn Heisler. Living in Boston, she became familiar with the coffee and offerings at area Dunkin’ shops, but her sights were set on practicing international law. Originally from Panama, Icaza returned home with her husband after graduation. For 10 years, she worked for a Panama City law firm, ultimately becoming a partner. Heisler, in the meantime, worked for the Panama Canal until the end of 1999, when Canal ownership reverted from the U.S. to Panama and his job was eliminated. At that point, the couple decided they wanted to return to the East Coast of the United States. By then, the couple had two small children—Carolina and Julia. Robert, their third child, would arrive soon after. Icaza chose to stay home with them while Heisler took a position as an attorney for the Patuxent River Naval Air Station along the Chesapeake Bay in Maryland. As the kids grew, Icaza pondered her next career move; she didn’t want to return to a law firm. When her in-laws came for a visit in 2005, it sparked a career change. “My mother-in-law said, ‘You need a Dunkin’ Donuts down here,’” Icaza recalls. “We looked it up on Saturday, and on Monday we called the brand, and here we are. 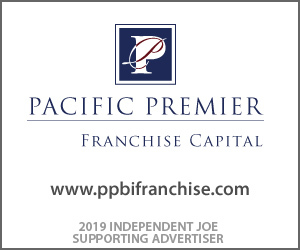 Icaza and Heisler researched several franchise opportunities, but felt none were the right fit. “We had looked at other brands, not food brands, and they had not been completely truthful with us,” she says. “They had told us that there weren’t any stores in southern Maryland, and there were. They had wanted me to go to a different market,” which Icaza wasn’t interested in doing, preferring to set up businesses closer to home. The first year was a true educational experience. “I went to the training with Dunkin’ and it was like when you go to college and go for your first job—you don’t know anything. The first year was a learning process for someone who doesn’t know about food or restaurants, learning to manage food and labor and the customers, and the store,” she says. It took Icaza about a year to find and open her first location in the town of California, and she learned that getting the right people in place was crucial. “I had a manager from day one,” she says. “The mistake many franchisees make is that they become the manager. But when you are teaching someone to swim, the coach is always outside the pool; otherwise, you are going to drown. Having the manager gave me the ability to open my second, third and fourth stores” because she was responsible for hiring crew members, overseeing operations, and managing the day-to-day operations of each store. In fact, having the right team in place early on helped provide a strong foundation from which to build. Kaiesha Carter is the network’s general manager, overseeing all the stores. Icaza also employs a network trainer to hire and train new crew members, but each store has its own manager. The team oversees training new crew members, and handles all labor issues. Currently, Icaza’s three Dunkin’ shops employ about 65 people, most of whom work part time. Once in place, things are scheduled and run accordingly, with crew meetings occurring once a month to talk about what’s coming up. Shift managers and managers have weekly calls on Mondays to discuss commuter services and drive-thru issues, and managers have weekly calls on Tuesdays to cover operational issues. Having the right staff has helped Icaza fulfill her commitment to develop three shops in St. Mary’s County before expanding to surrounding counties in Southern Maryland. So, what’s next? “I don’t have a specific number of stores I want to run and I don’t want to put a limit on any opportunities, but I do envision having more than five stores,” she says. Icaza admits she works a lot, but she devotes her down time to her family. 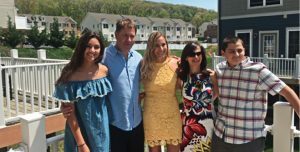 Her oldest daughter, Carolina, is now 22 and a recent James Madison College graduate, Julia is now 20 and a junior at Boston College, and Robert, 16, is a high school sophomore. The family travels to Panama several times a year, where they enjoy horseback riding and boating. Once in the door, Icaza’s team will “shadow the new crew members in their first week, and do online training,” says Icaza. “We try to keep our meetings serious but fun when it comes to operations.” Younger workers, especially like to be trained and appreciate being given credit when they learn things, she says. Icaza remembers people when they are off the clock, too. Icaza’s Dunkin’ stores are involved in several community service initiatives. They include Cops on the Rooftops, where local police officers spend 24 hours hanging out atop Dunkin’ shops while collecting donations to raise money for Special Olympics. It’s a cause Icaza feels strongly about; five of her employees have special needs. Her stores also raise money to assist veterans with medical and living costs. Icaza served on the board of directors for her local chamber of commerce and her shops sponsor a variety of initiatives in the local schools, including sports and teacher appreciation days. The couple is OK now and is back to their regular Dunkin’ visits. Jim, another regular customer, has undergone cancer treatment several times but still makes it into the Charlotte Hall Dunkin’ shop when he can. The strength of such relationships—at the local level with her customers and communities, or at the store level honoring a trusted associate with a Hoover Dam helicopter ride—are an important part of Icaza’s story as a successful Dunkin’ franchise owner.